For other uses, see Tympanum (disambiguation). Not to be confused with Timpani or Tympanum (architecture). Look up tympanum in Wiktionary, the free dictionary. In ancient Greece and Rome, the tympanum or tympanon (Ancient Greek: τύμπανον), was a type of frame drum or tambourine. It was circular, shallow, and beaten with the palm of the hand or a stick. Some representations show decorations or zill-like objects around the rim. The instrument was played by worshippers in the rites of Dionysus, Cybele, and Sabazius. The instrument came to Rome from Greece and the Near East, probably in association with the cult of Cybele. The first depiction in Greek art appears in the 8th century BC, on a bronze votive disc found in a cave on Crete that was a cult site for Zeus. The tympanum is one of the objects often carried in the thiasos, the retinue of Dionysus. The instrument is typically played by a maenad, while wind instruments such as pipes or the aulos are played by satyrs. The performance of frenzied music contributed to achieving the ecstatic state that Dionysian worshippers desired. 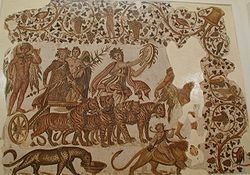 The tympanum was the most common of the musical instruments associated with the rites of Cybele in the art and literature of Greece and Rome, but does not appear in representations from Anatolia, where the goddess originated. From the 6th century BC, the iconography of Cybele as Meter ("Mother", or in Latin Magna Mater, "Great Mother") may show her with the tympanum balanced on her left arm, usually seated and with a lion on her lap or in attendance. The Homeric Hymn to the Great Mother says that the goddess loves the sound of the tympanum. The drum continued to feature as an attribute of Cybele into the Roman Imperial era. ^ Matthew Dillon (2002). Girls and Women in Classical Greek Religion. Routledge. p. 371. ^ Lynn E. Roller (1999). In Search of God the Mother: The Cult of Anatolian Cybele. University of California Press. p. 137. ^ Roller, In Search of God the Mother, p. 173. ^ John Boardman (1984). The Cambridge Ancient History Plates to Volume III. Cambridge University Press. pp. 210–211. ^ Rabun Taylor (2008). The Moral Mirror of Roman Art. Cambridge University Press. pp. 111–112. ^ Roller, In Search of God the Mother, p. 110. ^ Roller, In Search of God the Mother, p. 136. ^ John R. Clarke (2003). Art in the Lives of Ordinary Romans: Visual Representation and Non-Elite Viewers in Italy, 100 B.C.–A.D. 315. University of California Press. p. 90. This page was last edited on 1 June 2018, at 00:48 (UTC).